With the global promotion to increase the participation and enjoyment of tennis with children, Match Mate Tennis has engineered and has begun manufacturing the perfect 10 and under tennis ball machine. The QUICKSTART has the ability to throw all 3 stages of balls plus the standard regulation balls. Top speed is 30 mph. Safety first when working with the QUICKSTART! 10 Second delay and edge protected to prevent injuries. 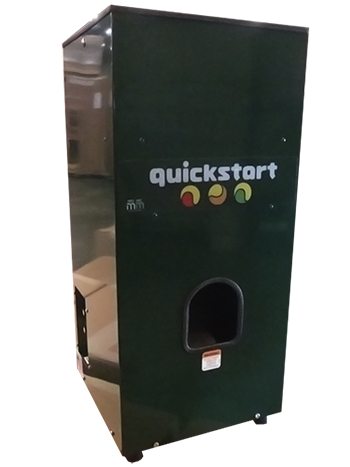 Like the Match Mate Rookie, the Quickstart Machine is constructed out of high grade aluminum. Bigger than the Rookie – the Quickstart dimensions are 12.5 x 12.5 x 28 but only weighs 4 more pounds. The Quickstart consists of 2 wheels and 3 motors. Easy access to the battery through the bottom. Specially designed ball feed which allows ALL sizes of balls to be thrown. On the Orange court or 60 ft. court, the orange (stage two) balls will travel from baseline to the opposite serviceline at top speeds of 26-28 mph.On the green (and regualtion) courts, the green (stage one) balls will travel from serviceline to serviceline at top speeds of 26-30 mph. The “Quickstart” will travel 10-11m (35-37) ft.’’ @ full speed with the red ball. With standard tennis balls the QUICKSTART shoots the ball at speeds up to 32 mph.